Yes, there are a lot of ordinary pigeons in New York, but Central Park is also a busy place for migratory birds. Over 200 different species of birds either live in or pass through the park during the year, making it one of the richest bird sanctuaries on the East Coast. Bring your children to the Henry Luce Nature Observatory at Belvedere Castle to pick up your free “Discovery Kit Backpacks.” The packs contain binoculars, a guidebook, maps, and sketching materials, so you’ll be fully prepared to see the warblers and songbirds at the best birding spots in the park like the Ramble, The North Woods, and The Great Hill. You might even catch a resident red-tailed hawk, which nests on Fifth Ave., flying between feeding spots. If you’d like to incorporate time on the ice with other outdoor fun, Wollman Rink offers gleeful gliding out in the open air. These enormously popular scavenger hunts are held in different locations like Central Park, Wall Street, and Midtown and happen to be one of the coolest ways to explore some of Manhattans historic locales. Themes range from finding spots immortalized in movies and television by quintessential New York films, to finding the former sites of major mafia violence in Little Italy. The family-friendliest is the “Secrets of Central Park Family Hunt,” where you find Stuart Little, decipher secret codes, unscramble messages, and search for a witch whose been turned to stone. Recommended for ages 7 and up. Putting on a pair of skates and attempting a triple lutz could be fun, but putting some skates on your kid and enjoying a rink-side hot cocoa might be more your style. Public rinks can be a bit crowded, but the pace on the ice is slow enough to suit a beginner. For kids coming from out-of-town especially, nighttime skating at Rockefeller Center, under the blinking cityscape and gi-normous Christmas Tree, is one of those idyllic New York experiences that won’t ever be forgotten. If you’d like to incorporate time on the ice with other outdoor fun, there are two rinks in Central Park, Wollman and Lasker that offer the same gleeful gliding, out in the open air. If you miss the winter-only window for these seasonal rinks, indoor mainstay “Sky Rink” at Chelsea Piers offers at least a few public skating hours every day of the week. Matching rhinestone studded costumes are not required. Miniature Golf on Randall’s Island is a sizeable, recreational land mass that sits in the East/Harlem Rivers between The Bronx, Queens, and Manhattan, Randall’s Island is the perfect destination for families craving sunshine, open air, and a variety of outdoor activities. Whether your children like soccer, tennis, or bicycling, Randall’s island is a guaranteed score. In addition to their state-of-the-art driving range, the large island boasts not one, but two miniature golf courses as well as a driving range, which is probably the safest bet for good fun with your children. Teach them putting basics and the intricacies of the final windmill, or just practice swinging and breathing the island air. Although New Yorkers frequently boast that their city “has everything,” they must concede the lack of mountains. 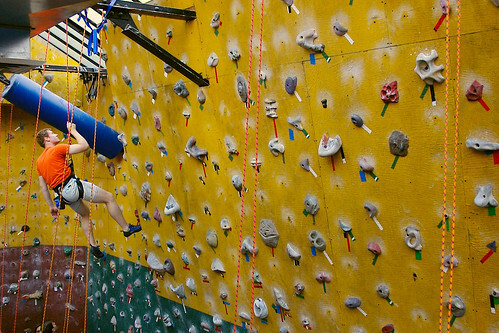 Enter the City Climbers Club: a small gym that fills the void with its giant, climbable rock walls, which perfectly simulate a mountainside. Founded and maintained as a nonprofit city program, the center offers instruction for all ages older than 7, and for every skill level. You and your youngest can try your hands (and feet) at this extreme sport in a safe environment and have fun in the process. If you’re a seasoned pro, it’s a great way to teach your children how to belay and rappel with little chance of accident. If you’re more of a spectator you can watch kids tire themselves out by literally climbing the walls while you kick back with a soft drink from the ubiquitous vending machines. A pool in the summer, Lasker Rink in Central Park has two oval rinks: one for high school hockey teams and one for all ages. This landmark bowling alley has played host to such bowling luminaries as Cameron Diaz and Richard Nixon, and the colorful, mid-century American decor is a lesson in kitsch. It feels a bit luxurious for a bowling alley, but this is Manhattan, where even the most mundane activities can be ridiculously stylish, so just roll with it. Bowlmor doesn’t allow kids after 5 p.m.; we recommend you have a lunch and then a game. Servers will bring burgers, buffalo wings, and quesadillas to your lane while you play. You’ll feel like local billionaire “The Donald” while you and your children cruise over Manhattan in a helicopter. Hover in the air, watch people and cars move around like insects, and your family will feel literally on top of the world for two – 15 minutes, depending on which tour package you select. Though all the tours offer their own stunning views of Manhattan, the “Lady Liberty” package takes you for a loop around our favorite green-complexioned broad for a unique perspective of her mammoth-ness.